After leaving Amazon we had two choices. Go north to Columbus for Christmas, or head straight to Texas to get started gate guarding. After some discussion we decided to head north for a quick visit. Two main reasons for the decision. First, my brother’s son was three this year, and I really wanted to be with his family Christmas morning. Two years ago I had the opportunity to be with my sister’s son for his first Christmas and the opportunity to be with my brother was important to me. For me, Christmas with little kids can’t be beat, and it definitely didn’t disappoint. The second reason was our furnace is still not working. The blower comes on, but it is not firing consistently. Even the few times we could get it to work, it would stop working after a while. So once again we were faced with when and where to get it fixed. We called the company in Columbus who “fixed” it the first time when we were there October and they are closed for the holidays, but open to walk-ins only on the 27th. Essentially we show up without an appointment and it’s first come/first serve. Since the warranty company will not pay for the same work twice, we felt we should at least try to get these folks to fix the problem, but based on past experience neither one of us is very hopeful. We got into Columbus Friday evening and spent some time with family. Lee is helping his parents with a few projects and I went to lunch with my Mom and her family. Mom did sell her house by the way, and she bought a place near Myrtle Beach. My mom doesn’t mess around when she’s made a decision, and before we even got here she had moved out of her house, sent most of her stuff down with the movers, and on December 27th she is heading to her new oceanfront condo. Really excited for her, because she got exactly what she was looking for at a price she could afford. I spent Christmas morning with my brother and his two kids which was great, Christmas isn’t the same without little kids around, and then we hung out an extra day waiting for the RV Dealership to open after their holiday break. When we go to my in-laws we park in front of their house, and stay in the house with them, which is usually not a problem if it is for a short stay. It’s rare that the weather gets this cold this quick in Columbus, so we rolled the dice and chose not to winterize the rig before traveling up. Winterizing is not a small project and since we were only going to be there a few days we definitely didn’t want to mess with that. So we hooked a small space heater up to a long extension cord, put it in the basement of the rig and that was enough to keep the temperatures above freezing. But the day after Christmas the temps plummeted and suddenly we were dealing with temps in the single digits and -6 windchill. Before I go any farther let me explain that last comment. We were talking to my father-in-law Denny about this and he was having a hard time understanding why we were so concerned and after we ran him through our history with getting work done on the rig he said he hadn’t read any of that in the blog. It occurred to me I have shied away from this particular issue, but Denny said “Let them have it” so here I am going to talk about this a bit. Please keep in mind, all experiences are different and I don’t speak for all RVers, but my thoughts are based both on our experiences, what I have personally witnessed happening to others, and anecdotal stories from our friends. In my opinion, one of the worst parts of being a full time RVer is when you need repairs. First, it is my home, so while the work is being done I need to find someplace else to be. If the work strings over multiple days, I need to not only be gone during the day but also move my home every night or if I am lucky I get to stay in the bay or on the dealers lot. If I am lucky enough to have someplace else to stay, I have to pack up my stuff and hope I have everything I need since everything I own is in my house. Compare it to having major construction done on your house, where you can’t live there, or if you do stay you have to be gone at the crack of dawn since most service departments start working at 7am. Same thing. Yes, some service bays have nice waiting rooms, but you still need to buy food and find something to do while you wait. Which takes me to the next problem. These are recreational vehicles and, in my opinion, the sense of urgency just isn’t the same as if you have a major home repair. Even if the repair shop is familiar with full time RVers and even if they tell you they can accommodate the fact that you live in the RV, in general these repairs aren’t quick. A couple of reasons for that. First and foremost these businesses are generally in the business of selling RV’s first, and fixing them second. Most have service bays to perform repairs on RV’s they sell and their money is made on supporting that customer base. As a person who bought their RV somewhere else, you get in line with the locals, and in my experience will get bumped by one of their local customers if something comes up. Most service centers also don’t stock a ton of parts. They will have some common ones, but anything complicated and you need to wait and depending on the problem you are experiencing you may not be able to move the rig independently until the work is done. So let me run you through how this happens, and again this is based on both our own experience and many other people we know. You are going down the road and develop some kind of an issue that needs to be resolved. If you are lucky you can continue to travel until you find a service center that works with full time RVers. You know this by calling them, telling them you are traveling and living in your RV and ask how they handle this. They will either have answers on how they handle this or they won’t. You’ll know pretty quickly. If they don’t have answers and it is an emergency situation, you will just have to work with them to figure it out. Either way, the person you talk to on the phone is generally a service coordinator and regardless of what they say your experience may change when you arrive. You arrive on site at the dealer and walk into the service area. The first question is, do we unhitch? Many dealers use their own vehicles to pull you into their bay, and once you unhitch (which takes a while), you go inside and wait. In my experience it takes at least an hour to even get you into a bay and that is if you are lucky. Even if you have an appointment, their bays are full, and it’s only until someone else’s work is done that a spot becomes available. Even if it’s pulled into the bay it doesn’t mean the work starts. Rarely are there enough techs to cover everything in the bay, so they work from a priority list. This is where the RV’s who were purchased locally come into play. Even if you have an appointment and arrive on time, if someone who bought there comes in that morning, odds are they will be pushed to the top of the list. This I have seen personally on more than one occasion, especially at busy service centers. At this point you have two choices. You can leave and find something to do, or you can wait in the waiting area. The problem with leaving is “out of sight out of mind”. Most people in that service bay have homes to go to, so they drop them off and pick them up when they are done. Their repairs can take weeks and unless they have a vacation or something coming up they may not care. We are different. We can’t wait weeks, but since we are the exception, we need to keep that fact right in front of the service folks. So we sit and wait. We talk to employees. We ask for status updates on our rig. It helps, especially in the smaller service centers, but it isn’t perfect. And it isn’t perfect because of the knowledge levels of the technicians. Most basic problems we handle ourselves. The only time we would go to a service center if something major is wrong and that means we need a senior tech. In my experience, most service centers only have a couple of those, so not only are you waiting your turn for a tech, but you are waiting for a senior tech. Despite having called and given details on the problem he is rarely assigned to the rig. So here is how it goes. You arrive and wait to get it pulled into the bay. A junior tech works on the problem for a while. He diagnoses the simple thing, which you know isn’t it because you have already looked at that. Right before lunch time they finally call in a senior tech. The senior tech doesn’t trust what the junior tech did, so he starts the diagnosis all over. He’s much faster though and eventually determines the problem. At this point they go see if they have the part. If you are really lucky it’s in stock, but even if they do have it, the senior tech can’t necessarily fix it that day because he has to finish the job he was pulled from when they called him to look on your rig. If they don’t have the part it generally takes a couple of days to get in, even if you are willing to pay extra. Now you have to figure out what to do for the night. Are they leaving it in the bay and you are staying in it or are they pulling it out and letting you stay on the lot? Or worst case, do they not allow either and you have to hitch up, go to a local campground, and come back when the part is in. And all of this is assuming, by the way, they figure out the problem the first day. At this point you might be thinking, what is the big deal? The idea that we are all footloose and fancy free and have nothing but time is a nice one, but for most people that is actually rarely the case. We have people we are supposed to see, campground reservations to change, weather related issues, or work commitments we need to meet. So we have to choose. Do we kick the can down the road and live with the issue, or do we change our schedule and get the work done? Either way, it’s rough to have your plans turned completely upside down and it’s stressful. In our case we tend to avoid stressful situations when we can, which is why we haven’t had a working furnace for over a year. We have tried on three occasions to get the problem fixed, and it hasn’t been. Oh yeah, I forgot to mention that. If they say they think they have fixed the problem, but it reoccurs, this can be a major issue. Not as big of a deal if you are still in the same area, but if you have moved on, which is likely, now you have to start all over. And our warranty company won’t pay for the same repair twice, so the second time it is on our dime. Yes, I suppose we could turn around and go back to the place that did the work originally, but that doesn’t always work with our travel schedule. Let me put it this way: Have you ever had a red light come on in your car and your service tech couldn’t figure out why? You take it back multiple times and they just can’t figure it out, or worse, it doesn’t happen in their shop…frustrating right? Now imagine the same thing was happening, except you have to take it to a new tech in a new city every time. Oh, and all your stuff is in your car and you can’t access it while they are working on it. And you are not sure where you are going to sleep that night because they keep your car and don’t have a loaner program. I know I am pushing the analogy here, but you get the point. So taking all that into account, perhaps you can see why we weren’t hopeful when we pulled into the dealer at 9am. It started with their computers were down and they had to dig through files to find our hard copy paperwork. Then they had to “open a space in the bay” for our rig. That in itself is telling. 9am appointment, and they weren’t ready for us when we arrived. Hmmmm. The reason they did this quickly was because it was below freezing and there was no heat source in the RV. When the service manager told me not to worry and that it would take some time to freeze up, I countered with are you willing to accept responsibility if it does? That at least got us into the bay a lot faster? And to her credit, she assigned us a senior tech first. Since they had done the original work and I made it clear we were on our way out of town, she pushed me to the front of the line. That could have gone a different way, but I am grateful that she did. 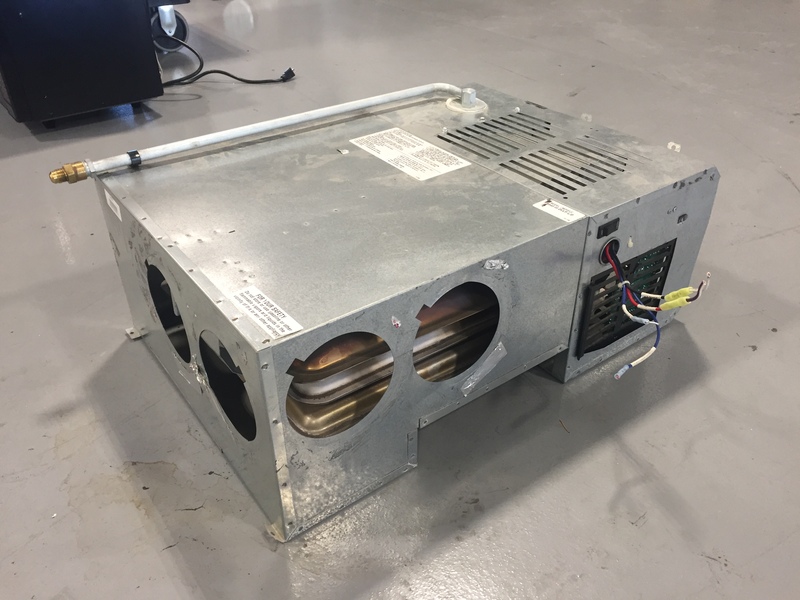 They pulled out the furnace, put it on a bench and hooked it to a battery and a propane tank, and were able to immediately duplicate the problem. That was good. Then multiple techs got involved trying to figure out what it was. They spent well over an hour fiddling with it. Finally the lead tech came out and told them to “stop screwing around playing detective” and just replace the easiest part and see if that worked. (I actually appreciated that they were being so thorough. I think the number one problem with these places is that they want to get people in, and get them out, and that often results in partial or misdiagnosed problems. And usually when someone is “tinkering” it means they are invested in what they are doing, and that’s how things get done well. The hardest part for me was staying out of it. Not my playground, not my swing set. 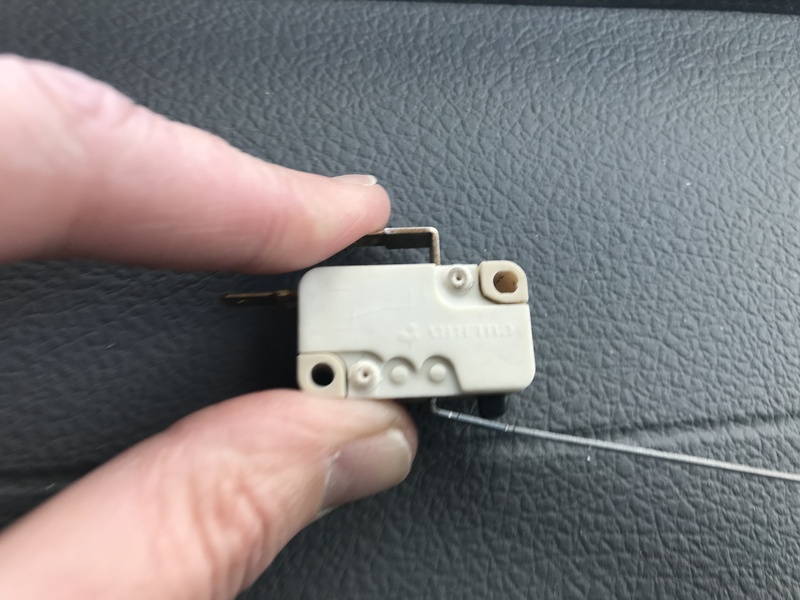 – Lee) So they replaced the sail switch. Important point here. Two of three times we have had service on the furnace the last year they said the replaced the sail switch but we don’t know if that was actually done. The part didn’t look brand new. One teeny tiny little part. Those are my fingers for scale, which are pretty small. The tech replaced it and then tested the furnace outside the rig for an over an hour and could not get it to fail. Then he put it back into the rig and again Lee and he tested it for an hour and it did not fail. During all of this, they gave me a loaner car, which was very nice, and I went out and got Lee some lunch. I sat in the waiting room, but he never left the rig. As always, excellent post! I’m sorry to hear about all your troubles with the furnace but glad it got fixed. You certainly hit the nail on the head regarding what getting service is like; been there, done that!!! Thanks!! Appreciate the support on this one. Glad that furnace is working now, Tracy! Most of the tricks we learned to survive that winter were from Glyn Carson. He wintered for many years in his RV in Alaska. These rigs aren’t meant for winter living, but it definitely is possible to get through the cold, if need be. One thing to point out: most of us don’t think about ease of repair when buying our rigs. We didn’t, and you probably didn’t either. You can bet that we will be the next time we buy a rig. 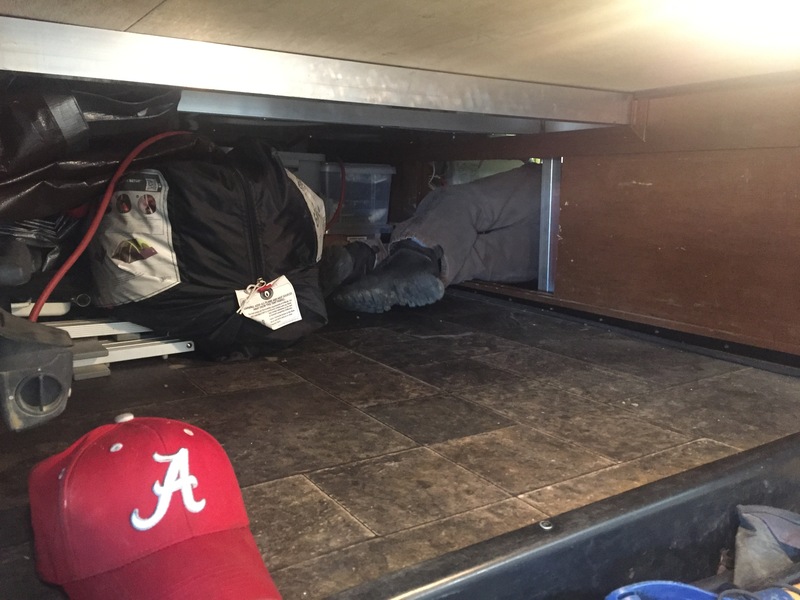 Fortunately for us, all of our items like the furnace are easily accessed (we can remove a vent cover inside the rig and have direct access to the furnace). Knowing now how easy it is for us to repair our rig makes it more likely that we will keep it longer. But when the time comes, we will note things like furnace location, as a result of what you’ve been through. Thanks for blogging about this issue. 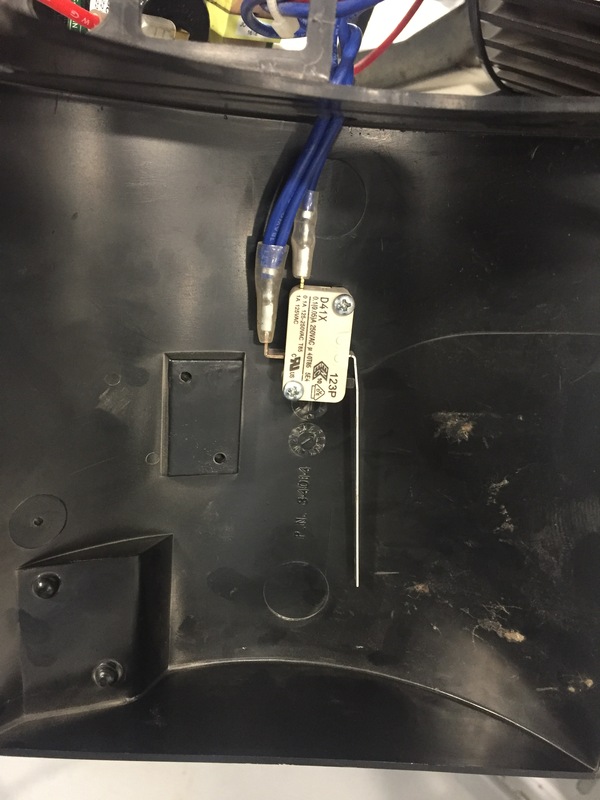 Good post, we’ve certainly experienced a lot of issues with repairs over the past few years. Love it when the senior tech is assigned, is making progress and then gets pulled away for another crisis leaving wires, tools, etc. sitting for a couple of hours. One thing we have started to look for, when it’s not an emergency repair, is a repair shop that does not actually sell RV’s. 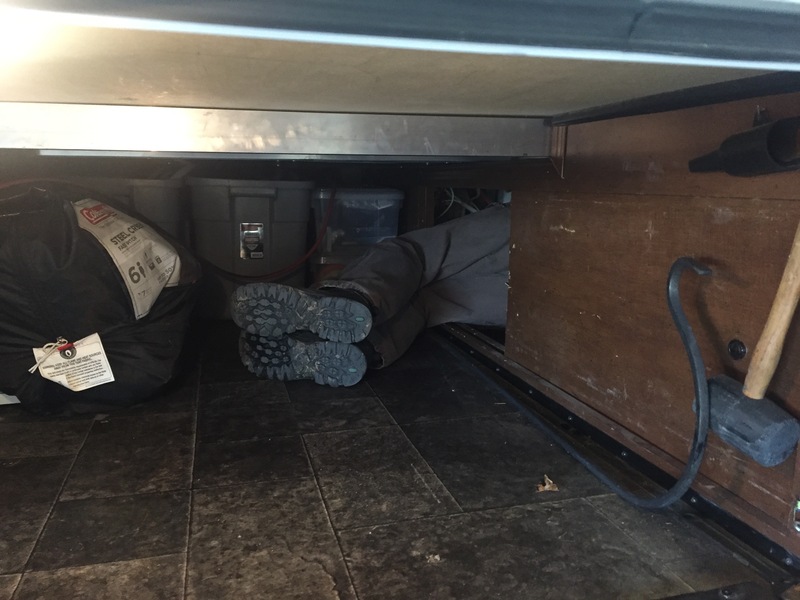 We’ve found one in Mesa AZ and that has worked well, we can stay in our rig onsite and even during the day, if they don’t need the slides in, we can stay and work inside while they work on the rig. They also will send a mobile tech to our RV park to do the diagnosis so they can order parts ahead of time which has helped speed up the process and keeps us from having to spend a day at their place for the diagnosis. Of course, that comes with a price but right now the trade off is time I can be working vs. taking vacation time so the mobile tech fee is worth it for us. Another big challenge we’ve had when we couldn’t stay in the rig was the limitation from the extended warranty and how long they will pay for hotel and meals. Reminding the shop on a daily basis that this is our home and if we have to extend another night in a hotel, they are costing us money helps! Never fun to deal with, but in the FT RV life, it’s always a when, not an if, that you are going to spend some time at a repair shop. You’re in good company! Hope this is the last furnace repair!! Thanks so much for the additional feedback. Those are great points. Yep, if you are a full-timer you have shared the repair nightmare:o(( However, we have also had some amazing repair experiences:o)) It is all about the journey!!! Real glad this was one of those good experiences. Now, off to warmer weather and a HAPPY NEW YEAR!!! Thanks a bunch for this post. As we prepare to take possession the third week of January, this is one of those things I hadn’t thought about. I know our furnace vents to the street side of the coach but never thought about accessibility for maintenance or repairs. Since we’ll start living in it in January, that’s an tem I’ll need to pay attention to at our PDI. So excited for you guys! And thanks for the kind words. So glad you are (hopefully) FINALLY done with furnace issues! Stupid little part! I can totally see why Lee didn’t want to crawl into that space! Honestly – Bill may have tried but not sure he’d fit! He (Lee) was smart though – staying there and letting them know he was watching. Bill loves to do that when he isn’t doing the work himself, asking appropriate questions along the way so they know he isn’t going to just take all they say at face value. 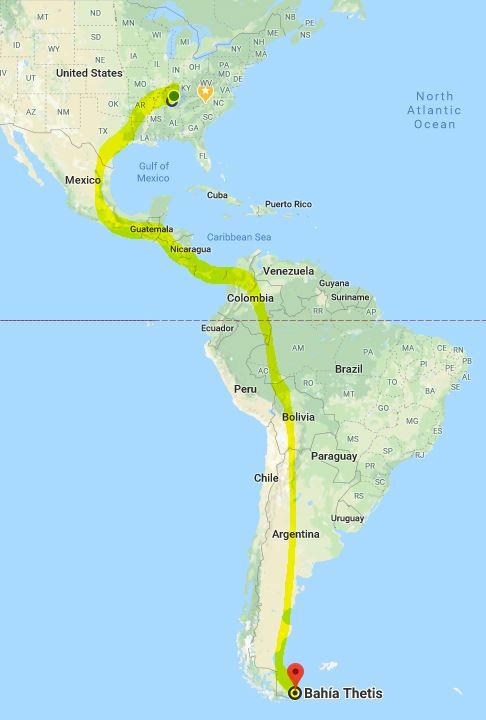 Hope you don’t need to drive all the way to the bottom of South America for warmer temps!